"Belfast!​ With Bess and Pietro, my family, my L'Arche family, we FLY!" ​ "Yes! ​​ ​I​ ​signed​ ​happily,​ ​​"today​ is​ the day​ we fly!" ​​She​ ​grabbed​ ​Pietro and​ ​I​ ​to​ ​steady​ ​herself​ ​as​ ​she​ ​shrieked​ ​with​ ​laughter​ ​in​ ​the​ ​crowded​ ​airport. In​ ​June,​ ​I​ ​experienced​ ​the​ ​great​ ​privilege​ ​of​ ​representing​ ​L'Arche​ ​Noah​ ​Sealth​ ​at​ ​the​ ​L'Arche International​ ​Federation​ ​Assembly​ ​in​ ​Belfast,​ ​Northern​ ​Ireland.​ ​​ ​Alongside​ ​our​ ​Board​ ​President Richard​ ​Hopp,​ ​and​ ​other​ ​familiar​ ​and​ ​dear​ ​faces​ ​from​ ​across​ ​our​ ​western​ ​region,​ ​we​ ​joined more​ ​than​ ​600​ ​“L'Archies”​ ​for​ ​a​ ​week​ ​of​ ​celebration​ ​and​ ​envisioning​ ​our​ ​future.​ ​This​ ​gathering takes​ ​place​ ​once​ ​every​ ​​five​​ ​years,​ ​causing​ ​us​ ​to​ ​savor​ ​every​ ​special​ ​moment​ ​of​ ​this​ ​unique time​ ​together. Exploring the city with L’Arche Paris... including a picnic by the Eiffle Tower! ​​​​First stop... Paris! L'Arche communities across Europe generously opened their doors to host those of us flying from overseas for a few days of home-stays before the Assembly in Northern Ireland. We encouraged to see and join our Parisian friends as they "lived L'Arche". We shared meals, strolled through the city, celebrated, and broke (fresh, deliciously flakey) bread together. We fumbled through our language divides with big smiles on our faces, comforted by the understanding that we are truly "all in this boat together" united and deepened by our shared love of L'Arche. Just​ ​when​ ​we​ ​were​ ​about​ ​to​ ​apply​ ​for​ ​French​ ​citizenship,​ ​it​ ​was​ ​time​ ​to​ ​leave​ ​for​ ​Belfast! Walking​ ​into​ ​the​ ​main​ ​hall​ ​on​ ​the​ ​Queens​ ​University​ ​campus​ ​was​ ​nothing​ ​short​ ​of​ ​an​ ​explosion of​ ​color​ ​and​ ​culture.​ ​A​ ​glorious​ ​cacophony​ ​of​ ​​ ​languages​ ​swirled​ ​through​ ​the​ ​air​ ​as​ ​friends​ ​old and​ ​new​ ​embraced​ ​each​ ​other​ ​under​ ​bright​ ​waves​ ​of​ ​fluttering​ ​banners​ ​and​ ​streamers.​ ​​ ​The music​ ​swelled​ ​and​ ​600​ ​voices​ ​sang,​ ​laughed,​ ​clapped​ ​and​ ​cheered​ ​the​ ​commencement​ ​of​ ​our time​ ​together.​ ​​ ​I​ ​looked​ ​at​ ​Kendyl​ ​and​ ​saw​ ​my​ ​own​ ​wonder​ ​reflected​ ​in​ ​her​ ​eyes.​ ​​ ​Look​ ​at​ ​what we​ ​are​ ​a​ ​part​ ​of,​ ​look​ ​and​ ​this​ ​incredible​ ​family! "L'Arche is an embarrassment of riches," a new friend said to me over dinner. I sat back and nodded my head... that was the perfect description. Our coffers overflow with kind, compassionate, visionary, and gentle people here in L'Arche. People who lovingly cross mainstream boundaries to demonstrate that a more human society is possible. Our overseas adventure was brimming with the unfamiliar and the deeply familiar all at once. Often separated by language or culture, we continually found ourselves strangely and wonderfully at home with our new L'Arche friends from all over the globe. Kendyl endlessly made people feel welcome by signing enthusiastically, and patiently teaching them how to speak with and include her. While Pietro and I were there partially as an sign language interpretive supports for her, I found myself marveling as she navigated communication with friends from across the world without much need for our help. Her pure and enthusiastic love was clearly understood. An abiding sense of belonging was present in all my days both in Paris and Belfast. 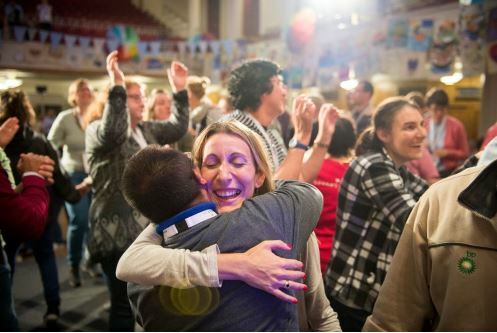 I was inspired by the passion and care by which our common vision connects us all... across land, sea, culture, and language, L'Arche is fearlessly bridging our differences and gently changing those of us lucky enough to step into the boat. For a closer look at Belfast 2017, please visit L’Arche International’s page on YouTube and watch the “day in review” videos from the Assembly.